Fundraiser by Morgan Randall : Help Re-open The Grape! Some things just go together. Macaroni and cheese. Peanut butter and jelly. Wine in a can and bad decisions. Live jazz music and The Grape in Ventura. Anyone who has been to The Grape knows why it needs preserving. 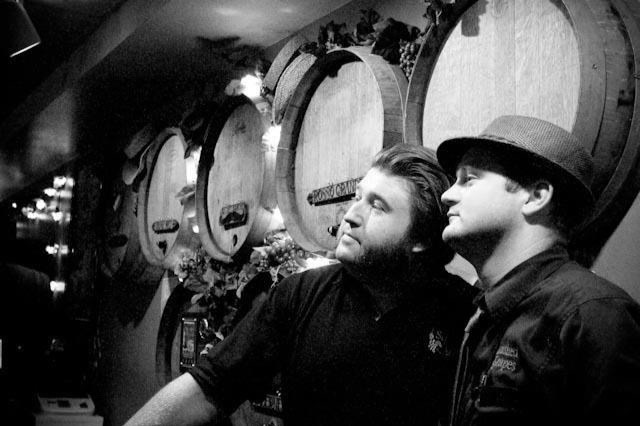 Since 2007, Adam Randall and Josh McNutt have worked tirelessly to provide a home away from home for their Southern California community in the form of a boutique winery and bar. In 2011, they shifted gears and began offering a home for jazz musicians, too. 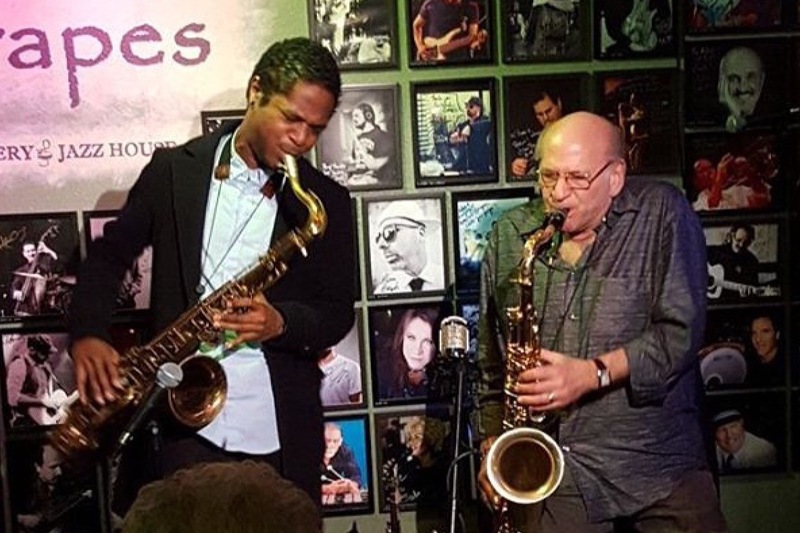 The Grape has also hosted David Liebman, a prolific saxophonist known for touring with Miles Davis, and Tom Scott, a Grammy award-winning saxophonist. Then there’s Charles Lloyd, an accomplished saxophonist in his own right, but those unfamiliar with jazz culture will recognize his work with the Doors, Canned Heat, and the Beach Boys. These names, along with many other world class musicians, have graced The Grape’s iconic “Wall of Fame,” and have helped make it one of the most notable California jazz clubs outside of Los Angeles and San Francisco. Despite the influx of high-quality musicians and the deepening ties with the community, The Grape’s wine-centric business model is not financially sustainable in the long term. Simply put, there is not enough money in the (affordably priced) wine business alone to continue attracting world-class musicians or support its current staff with a viable standard of living. 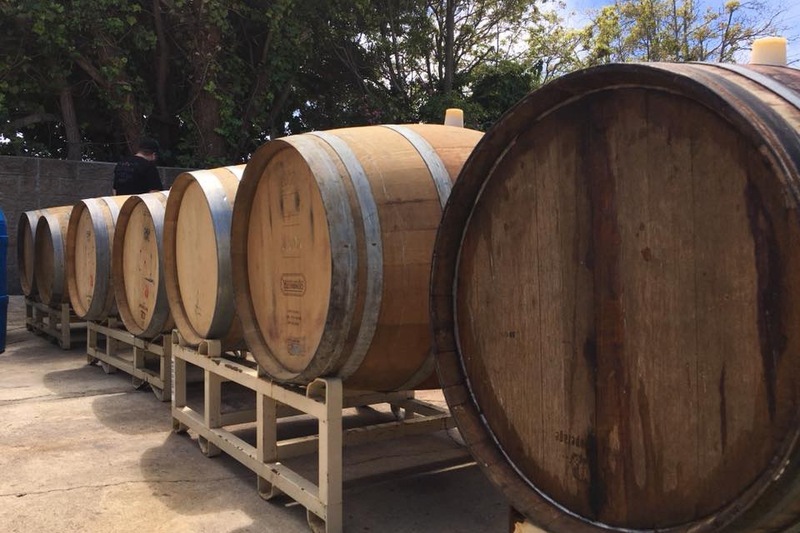 In order to keep the doors open while keeping prices affordable for the community, The Grape needed to revamp its business model, which it seeks to do with the introduction of the new liquor license. However, the introduction of a new license means that legally, The Grape needs to open a jazz club in a location separate from the winery. So in April 2018, Adam and Josh closed the old club with the intention of reopening at new locations -- a winery off of Market Street and a jazz bar still on Main Street -- within a few months. The Thomas Fire, which ripped through Ventura at the end of 2017, has thrown the mother of all wrenches into The Grape’s reopening schedule. Understandably, the city’s system for issuing building permits has become backed up while victims of the fire try to piece their lives back together. The Grape’s permits and build-out plans, deemed a lower priority, have therefore sunk to the bottom of the pile. And it's not just local government that is working to deal with the increased load; private architects and contractors have also been hit with a sudden influx of new clients, bringing an additional layer of challenge to an already difficult transition. Adam and Josh’s two new locations cannot conduct any business -- and in some cases cannot make any design improvements -- while they wait for contractors to create and then officials to approve paperwork. This has increased their incidental costs well beyond what they could’ve foreseen or planned for. In all of this, there’s good news. Once the permits are approved, the winery location on Market Street is almost ready to open. That means that you could be able to enjoy the wine, music, and people you love as soon as January 2019. Once the Main Street jazz club's build plans are approved, then The Grape will be scheduled for a public hearing -- but still four months later. (This is standard protocol for a location that plans to serve liquor.) After that, total build-out on the jazz club can happen. We already have the necessary investment set aside for a total build-out, but we'll still need to wait until contractors are available to come in and finish the job. Adam and Josh just need a little help covering incidentals to make it across the finish line. Your donation makes it possible for them to fully devote themselves and their time to making these community hubs a reality. If you’ve ever been to The Grape, you know it’s more than a bar or a club -- it’s a family. Adam Randall dedicates himself full-time to offering this second home for jazz fans and musicians. He pours an untold number of hours and manual labor into making sure the winery and club are safe, beautiful spaces for the community to congregate. 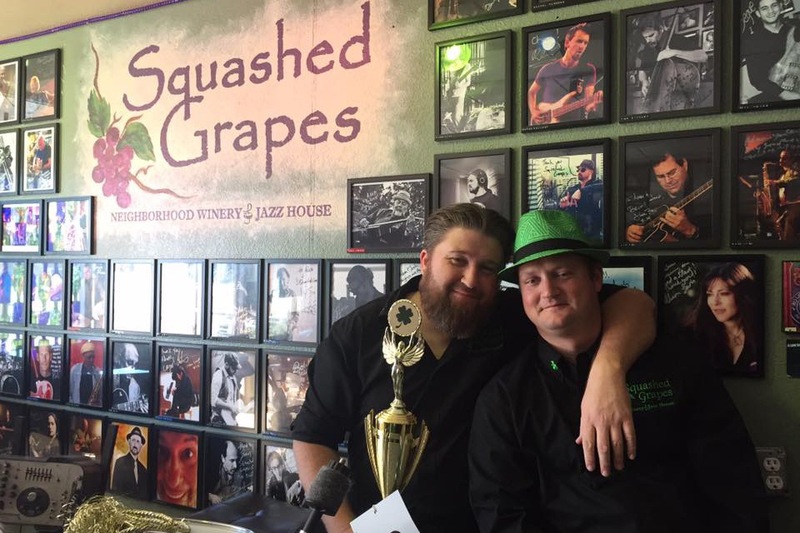 Josh McNutt has been devoted to The Grape since the very beginning. His passion for good food, good drinks, and good company has created the inclusive, hospitable environment that many Grapers have come to know and love. Both of them are committed to providing an accessible, affordable place in the neighborhood that preserves and stimulates jazz music. From the bottom of their hearts, they’re truly grateful for the community’s years of support and all the support yet to come. Happy New Year Y'all! Things are moving right along on the new club. We are really looking forward to getting it open some time during the first half of this year. In the mean time, we have been working on a "proof of concept" project that has turned out to be quite exciting. The Grape crew has taken over Ventura's Hong Kong Inn (downtown). The Hong Kong has been a fixture in town since 1971, but the owners are ready to move on to other things, so the business is up for sale. We have stepped in and taken over operations until it finds a new owner. What does this mean? It means we get to test out future signature drinks like our New Orleans style Old Fassion. We get to test and train our future staff. Most importantly, we keep our players playing and our patrons patroning. We invite you to come take a peak into the future of jazz in Ventura, the future that YOU are helping us make a reality with your generous contributions!! Josh and I are extremely grateful for all the help. Keeping this mission moving in the right direction is almost $1,000 per week, and we wouldn't be able to do it without the support of the community! But, we believe in our bones that in the end, the juice will be worth the squeeze. Get down to the Hong Kong Inn this month a see just what kind of momentum the Ventura jazz, and The Grape at large, has going. Say hello and collect your free hug. 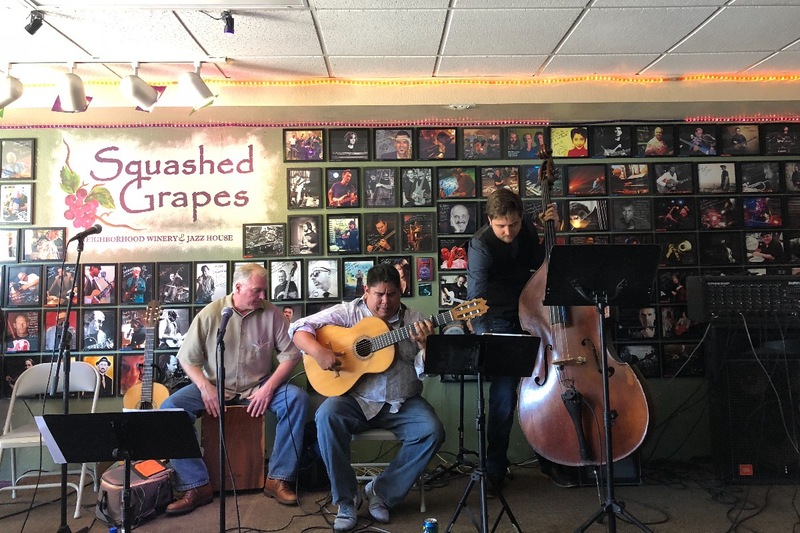 The Grape - "Home of Ventura's Jazz Renascence." Come see Jimmy burn up his vintage B3 organ! If you've never seen this show, it's something you'll remember forever! A combination of jazz performance, story telling, and a journey through jazz history all at the same time. The perfect evening for a very special date night! Ventura's favorite tiki band! What's so cool about a tiki band? Well, besides the fact that they are world renowned musicians, island music makes daytime drinking totally respectable! To make it even better, they will be joined by special guest Dirk Shumaker of Big Bad Voodoo Daddy on bass! It's very humbling to receive such support from our family, which is everyone here. I'm very happy to say that the progress is picking up momentum. The project has finally moved from the "if" category to the "when" category. This is partially why we waited so long to put together a crowd funding project, because we didn't want to accept money from our most supportive fans for something that might not materialize. To reiterate, Josh and I have assembled (with the help from some angels) the capitol needed to open the club, but no one could have budgeted for the fire and overall extent of the delays. In addition to that, our musicians and customers expect and deserve the highest quality music experience. This means cutting no corners on sound system, backline, and lighting. We know everyone is anxious for some good music, so Josh and I are working on some really cool concert dates during the holidays, held in some pretty cool locations. Everyone that has so graciously been supporting us on this page will receive a special invite! Keep an eye out for a newsletter just around the corner. In addition to the wonderful folks here, there have been a number of people working tirelessly behind the scenes to help make the dream work. I'd like to recognize L.J. and Diane Jones, Dave Derge, Diane Perham, our new landlord Gale Albright, and a special thanks to my sister Morgan for all things digitally and grammatically correct. This jazz club is going to be the musical jewel of Ventura County. I can't wait to hold the door for each and every one of you.